Our course is beginning soon, with the first in person session scheduled for October 2-3 in Vancouver. This morning (Vancouver time) Bronagh and I hosted about 15 registered participants from both the Glasgow and the Vancouver courses in an hour long webinar to get to know each other and to have a quick touch in to some of the core concepts in complexity that we are working with. Non-Causality. Complex systems result from a bundle of causes and effects all tied together, all reliant on one another and all changing all the time. There is nothing we can do to assure ourselves that action A will have result B. We can go back in time to understand how we got to a certain place, but we cannot use that same view going forward. Emergence. Emergence is a feature of complex systems. A human being is more than the sum of it's parts, and any effort to reduce a human being to parts results in a little bag of chemicals worth about $27. Reductionist strategies - diagnosing problems by breaking them down - has no applicability in emergent settings, therefore working in complexity means engaging emergence and using it to address problems. ​The future isn't knowable. While we may be able to take guesses at where things are going, the future is fundamentally unknowable, making linear and predictive planning processes ineffective when dealing with complex problems. Planning, engagement and evaluation therefore need to happen in rapid feedback loops that continually inform us about the emerging present and potential possibilities as they emerge. Diversity is our resource and needs to be engaged. Narrowing a view on a complex problem results in people bringing biases, and entrained thinking to the party. Those cognitive tools - which actually have evolved to help us make sense of the world - need to be engaged and disrupted in order for us to see more of what is and what might be possible. Engaging diverse voices, perspectives and talents makes it possible to create responses that are coherent with the types of problems we face in complex environments. Curiosity, conversation, dialogue and collective sense making are the tools we need. There is really no better place to start than with these four pillars. All four represent challenges to linear thinking and they are all places where groups and organizations I work with get stuck. For facilitators and strategists working in complexity, it's important that we get comfortable with these four pillars through practice and reflection. This is what we are hoping to support through this program. One the of the things that most hooks me when exploring complexity is that it uses pretty cutting edge science and learning on how humans, society, and culture actually work and goes from there. In particular, I’m drawing on the field of complexity known as anthro-complexity and which has strong crossover with the world of cultural evolution. Crucially, this epistemological approach move it out of being just another ‘next big thing’ conceptual fad and instead draws on the rigour and knowledge of the natural sciences to underpin it. Anthro-complexity, largely pioneered by Dave Snowden, argues that complexity in human systems isn’t quite the same as with ants or flocking birds as humans have intention, identity and intelligence. In recognising what it means to be human it draws insights from linguistics and neuroscience, as well as, anthropology and evolutionary science to develop its theories of how change actually happens which then informs the practice and action. Of course, this cuts across a huge range of very specialised subject areas but some of the insights that are currently yielded, for me, feel like they have the potential to be quite significant in pursuing radical social change should we be able to engage with the knowledge and figure out how to leverage it. Fundamentally, I am asking myself what would our change work - from culture change to activism - look like if we could we really harness the understanding of what it means to be human in a complex adaptative system? One insight that I’ve been reflecting on relates to identity. We are multiple identities - parallel and serial – these range from the deeply personal (parent, sister, partner), to the collective formal (work group, organisation) and informal (sports club, peer group) (see Ghoh, Ritualisation & Game-Playing) - and, critically, our identities shape our actions in context. The identities we inhabit can be managed and shaped by aligning them with roles and one of the key ways of doing this is through ritual - a prescribed routine that we follow every time we do something. So, for example, changing what you wear can actually shape how you see the world. In this way, changing into a uniform can be seen as a ritual that will align the identity of say, a firefighter, with the role expected of her in that context. In Art of Hosting we check-in, it’s a ritual, and I often think about how important that is to bringing to the centre that part of me that hosts, thinks about process and containers, and some of the behaviours and mindsets that go with it. So, if the science is telling us that people sense and see the world differently depending on the identity they are in within a specific context or group, how might we or what is the potential to use this insight for those interested in social change? I think about the identities, often unhelpful, we encounter in our institutions and how might they be shifted. What would a genuine public service identity look like? I wonder about the creation or re-shaping of identity connected to community and place and the behaviours that could encourage among residents. I hold curiosity about about our identity as citizens - what are the rituals attached to it? How is it currently activated or how could it be activated? At a time when the efficacy of marching and protesting is being questioned I think about their key role in identity formation for activists and how important they are for that and, therefore, why we need to continue to convene spaces which help shape identities centred on taking action on things we believe in. Of course, I’m pushing this insight quite far to illustrate why understanding what it means to be human is so important. For now, perhaps, we might want to start working with this at a slightly smaller level...maybe, think about the communities and groupings you are part of and the identities that you play, or that are played within that place? What behaviours go with that? What are the little routines or habits that you can recognise as rituals? What do you notice about how identity plays out in your contexts? In working with complexity, I have found it very useful to share frameworks with clients who are struggling to understand the nature of the kinds of problems that they are facing. 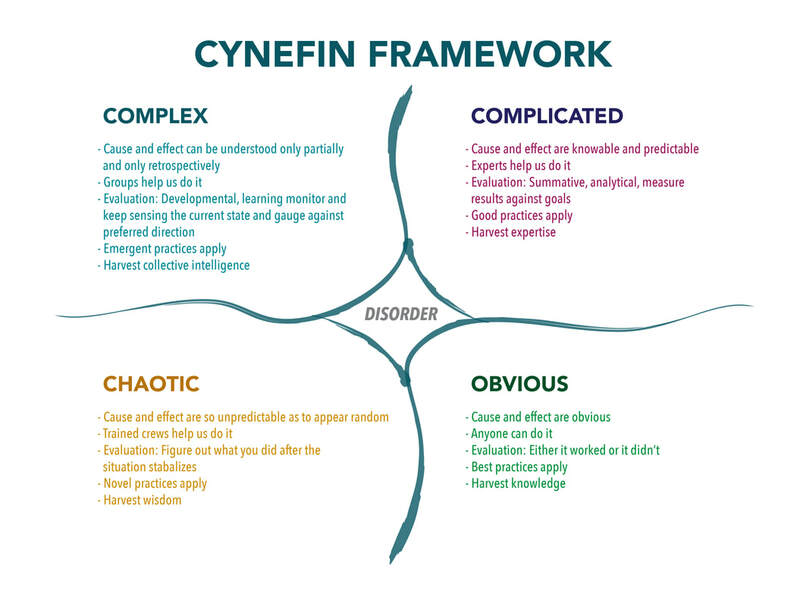 One of the frameworks that has been most useful to me over the past ten years or so has been the Cynefin framework, developed by Dave Snowden and colleagues. Cynefin was originally designed as a way of helping leaders make decisions, and I still use it that way today. It helps us to see the nature of the problems we are confronting and to make good strategic decisions that acknowledge whether a problems is solvable or note. The original paper by Dave Snowden and Mary Boone remains a great starting point for introducing leaders to Cynefin as a framework and I still share this paper with clients to this day. One of the challenges though is how to make the framework accessible and understandable to leaders so that a team or organization can quickly grasp the usefulness of this way of working. During our workshops we will cover the Cynefin framework, and whether or not it is already familiar to you, we'll explore ways to make it easier and more active to work with. We'll go over a couple of methods of understanding and sharing Cynefin and engage in peer conversations about how participants are already using it to make sense of the complex challenges we face. Personally I'm looking forward to these conversations, as I'm always on the hunt for another way to make good theory practical and useful. As Bronagh Gallagher and I have been musing about our offering on complexity, facilitation and social justice, we have been discussing the shift in activism from ideology to evolutionary. Ideological movements try to coalesce activities and people along a line towards a fixed end state. Evolutionary movements start with intentions, principles and move outward in multiple directions along vectors. They adjust and learn as they go, and they both respond to and change their context. Being labeled a “movement” is a reflection of evolutionary status. One person or organization does not qualify as a movement, yet there is no set size of a movement. Movements are messy, complex and organic. The movement label is shorthand, an inclusive term of many independent leaders and supporters, their support structures, all that they can tap into, as well as their capacity to disagree as often as they align on work. Movements are a reflection of self-directed, adaptive, resilient, self-sacrificing, supported and persistent initiatives to work on complex problems. There are no movement structures, but instead a movement is a mass migration of people, organizations, businesses and communities unified in common story, driving to shift culture, policy, behavior and norms. Successful movements build and transform the landscape as they progress providing a base for further progress. A quick scan of the first few pages of google news for” movements” produces a snapshot of the current movements that come to mind, including the movement against fracking, the climate change movement, the tea party movement, Occupy, #blacklivesmatter, the anti-austerity movement, the dump-Trump movement, the maker-movement, the LGBTQ movement–the list goes on. A key evolution point in a movement’s trajectory is the transition away from any single point of failure, to be loosely structured and resilient enough to absorb setbacks. The agility and adaptive characteristics of movements are fueled not only by personal stakes, individualism, driven leadership, passion and local control, but also by unpredictable solidarity and a distributed organizing approach that resists centralization. The difference between an organization, coalition, centralized campaign and a genuine movement is the way each fuels smart local initiatives and the ways leaders align power. Building a movement is actually more aptly perceived as unleashing a movement, creating new spaces that help the movement surge in wider, expansive and still supportive directions. As a movement gains organizing momentum, strategies shift to broadly unfold and push a wide set of actions that draw opposition thin rather than clustering and making defense easy. This distributed layout requires a shift in thinking and strategy. The key thing to notice here is that culture is changed by evolving movements, not linear programs. Movements are not led TOWARDS a goal, but rather emanate from a set of connected and coherent stories, actions and intentions, and self-correct, fail and adapt as they go. This is true whether the venue of action is organizational or societal. Cultures are complex and require complexity to change them. Diving more into the examples given in the quote will give you more insight into how these movements have become a part of, and transformative agents within, the cultures they are aiming to change.